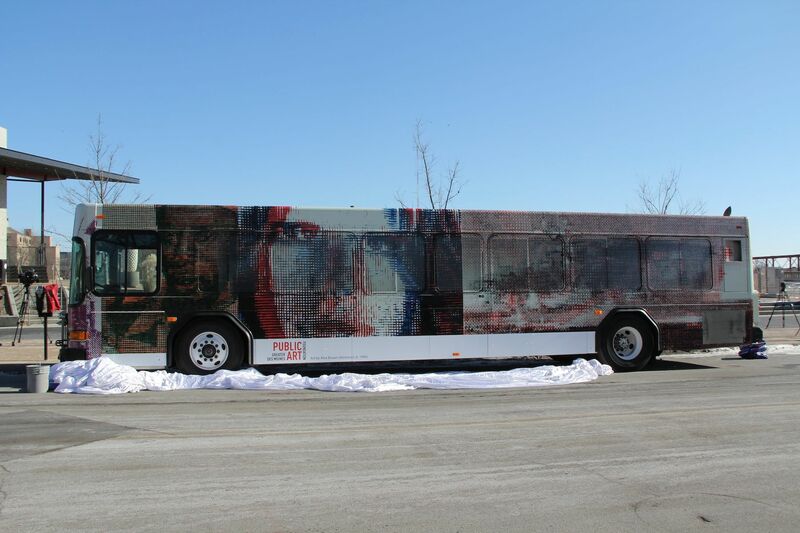 The Greater Des Moines Public Art Foundation is using a city bus as an art gallery. 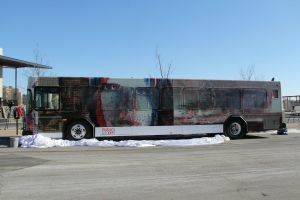 Photographs of Alex Brown’s paintings are on a vinyl seal surrounding the bus as it travels its routes. Brown says he composed images of aircraft and faces that are hard to make out at close range, but they become clearer from a distance. “I was playing with the registry of things sort of slipping and being out of focus…kind of a varied combination of things that my eye kind of was attracted to,” Brown says. In six months, Brown’s work will be replaced by another artist. Public Art Foundation director Jessica Rowe says this is an inexpensive way to exhibit new art. “A temporary work gives you a lot of freedom to do something spontaneous, something exciting, something that’s happening in different places around the community and hundreds of thousands of people (will be) seeing it,” Rowe said. Only one bus traveling city routes is being used for this project. Work by four artists will be displayed at six-month intervals through 2016.